As we approach Christmas and continue to work our way through the Yamas, we hit upon Asteya – ‘Non-stealing’, which seems very timely for the last blog of the year. Of course we are all helped to understand – as we grow up – the difference between right and wrong, good and bad.If we look beyond the obvious of stealing items that do not belong to us, perhaps we can begin to understand the deeper meaning of Asteya. The internet was first created in the Eighties for scientists and researchers to be able to share their findings. It was in 1990 that computer scientist Tim Berners-Lee first created the Worldwide Web. Such a shame really that something originally created for sharing is now full of plagiarism. People stealing others’ ideas, innovations and images –and thinking nothing about claiming it as their own. 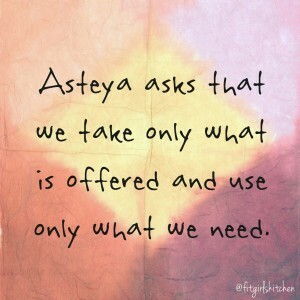 Perhaps we could also look at Asteya in terms of only taking what is freely given. Living simply and taking only what we need. Something to think about at this time of year, when excess and over- indulgence is celebrated. We can also take that onto the mat and “give up wanting what other people have” (Rumi). Our words and thoughts create the lives we live. These words and thoughts create the chemistry within….that is the chemistry that we give out….which is exactly what is attracted back to us. When we are on the mat, it is easy to be distracted by others around us (perhaps stealing their energy too) rather than being happy in the knowledge that we are exactly where we should be..perfect as we are..with all that we need. In the whirlwind of our complex lives, we can forget our deepest values and intentions. But when we come to the end of our lives and look back, what will we ask? Did I win all my fights? Did I make lots of money? Did I make people see things my way? Did I live a full life? Did I live with integrity? Expressed as a positive, Asteya means generosity: to give, to share and to rejoice. The perfect time of year to put that into practice!